this is my 100th post, i’m pretty excited about that! i started this blog long ago but i only made a real committment to it (to writing about food and making recipes for myself and for anyone who might enjoy them) back in january. half a year and 100 posts later, i’m still finding my way, but it’s made me happy to share the food that excites me and most importantly, nourishes me, with people–with you. thanks for reading! really. well the weekend’s upon us again and i have two special birthday parties to attend, two new food joints in my neighborhood to check out, and lots of great food ahead of me. but really, i am still thinking back fondly to last weekend which was so food-tastic i have to share it with you. thursday: um…actually, i was off to only a lukewarm start…dinner with two of my oldest, closest friends (fantastic) at a restaurant that i once had a great experience at, but this time, had a fairly mediocre one (meh). the highlight was the company and with no serious complaints about the meal, it was still a great night. at least half of my enjoyment from eating comes from eating with people i love. friday: we had 5 lovely guests over for a late lunch and drinks, one who was still too little to eat! we enjoyed plenty of good wine (not the little one!!) and i served korean pancakesand my new summer squash and sesame salad. 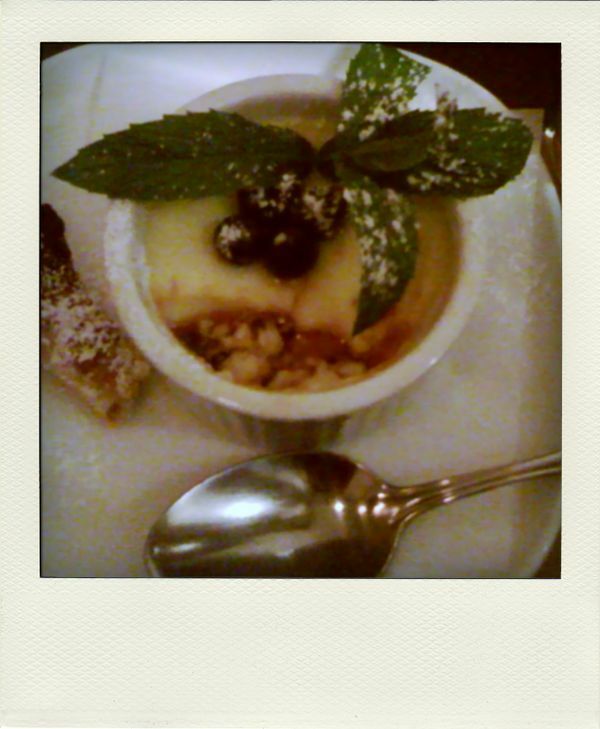 saturday: an impromptu dinner date–summerlicious (thought i’d never do it again, but at $25 and so close by…) at batifole. was in no rush to go, to be honest, but i totally underestimated them! we ordered our first bottle of cahors since coming back from france which was exciting enough, and every course was generous and delicious. i loved it all, from the rich eggplant mousseline, savoury stuffed vegetables provencal, a surprise serving of frites and a strong creme caramel (pictured above). the atmosphere was also warm and lively–don’t let any pictures you find online fool you–it’s lovely. sunday: my first brunch at sadie’s diner for their traditional vegetarian breakfast. i dipped my (fairly convincing) veggie bacon into maple-spiked baked beans and i was sold. despite leaving brunch satisfied, i wasn’t about to turn down free rice and curry at the indian festival at queen’s quay that we visited next, nor one love carribean food’s famous corn soup and spiced, grilled corn at the harbourfront where i ended my day. i must have been too excited by the options to be stuffed. this is my version of “kid in a candy store”. now i just have to figure out how i can fit in yoga twice a day while getting a second job so that i can continue to enjoy weekends like this without getting too pudgy or too broke… i’ll ponder it over a glass of wine at swirl on queen tonight. happy weekend, everyone!